This week’s Know who you’re Googling covers Mary Shelley, the oft-adapted author, mother of modern horror and independent woman. So it’s 1814 and you’re a 16-year-old girl from an intellectual family. You’re well-read, clever and curious about the world. Do you sit around playing the piano, working on your embroidery and occupying yourself with other modest, womanly pursuits? Or do you run off with a married man? Mmmm, for Mary Shelley (1797-1851), it was a no-brainer and it ultimately resulted in the most famous horror story of all time. Mary’s mother was Mary Wollstonecraft, noted feminist author of A Vindication of the Rights of Women (1792); her father, William Godwin, was the political philosopher who wrote An Enquiry Concerning Political Justice (1793). Her mother died soon after Mary’s birth and she grew up with her father and various step-siblings in an environment focused on philosophy, politics, literature and the arts. Among the visitors to her father’s home was poet and radical thinker Percy Bysshe Shelley, an admirer of Godwin’s philosophy. Shelley was already married and a father when he and Mary decided to run off together. She was 16, he was 22. Mary and Shelley took off for Europe. Upon returning to England they lived quietly because Shelley was trying to avoid his creditors, not to mention his wife. Mary was pregnant. Godwin refused to speak to his daughter. Oh, it was all very soap-opera-ish. Over the next eighteen months or so, Shelley’s wife drowned herself, Mary’s step-sister Fanny committed suicide (unrequited love for Shelley? ), Mary lost her child and became pregnant with another. In 1816, Mary and Shelley (now married) returned to Switzerland to stay with poet Lord Byron, who by the way, had recently had an affair with Mary’s other step-sister Claire, leaving her pregnant. So much for the alleged puritanism of nineteenth-century England. Really, these Godwin girls challenge many of our preconceptions about the time. Byron suggested that his guests have a go at writing a ghost story. Mary, then 18, was inspired by current scientific theories about the “states of life and death” and considered the idea of reanimating a corpse. Her novel Frankenstein (published in 1818) was the result. Most people are familiar with the 1931 film featuring Boris Karloff as the “monster” (and subsequent versions), but there’s more to her creation than any Hollywood interpretation. In Mary’s novel, Victor Frankenstein builds a creature from second-hand body parts and brings it to life. How he does this is not exactly spelled out, but in the movies, it’s done using some pretty fancy schmancy electrical paraphernalia that harnesses the natural power of lightning. Victor’s experiment succeeds but he’s repulsed by the creature’s grotesque appearance and turfs him out, which is not only irresponsible and immature, but really mean. A bit like a parent kicking out a newborn. The “monster” is actually quite gentle and wants to find friends, but realises his ugliness prevents this. Wracked with loneliness, he asks Victor to make him a mate, promising to disappear into the wilderness with her. Victor agrees but then freaks out thinking that a menacing new race will eventuate, so he destroys his female creature while the monster is watching. Not the best move, as it turns out. The monster is shattered, and first kills Victor’s friend, then his fiancée. Victor chases him to the North Pole where he dies, and the grief-stricken monster disappears and presumed dead. Hoo boy, what a roller coaster ride. The book’s full title is Frankenstein, or the Modern Prometheus and refers to Victor, not his creation. Mary Shelley is referencing the Greek myth in which Prometheus created mankind. Google it, it’s a doozy of a myth. Frankenstein is not just a horror story, hardly surprising given Mary’s intellect. She tackles issues of creation/birth, parental responsibility, the pursuit of knowledge at any cost, God versus science, good versus evil, revenge, the power of nature. It’s an ambitious work with a lasting influence. Percy drowned in 1822, leaving Mary a widow at 24. But there was way more to Mary than being Shelley’s wife and the author of Frankenstein. To support herself and her only surviving child, she continued to write, penning novels, travel pieces and stories. She was an accomplished editor and she championed Shelley’s poetry, saving him from possible obscurity. 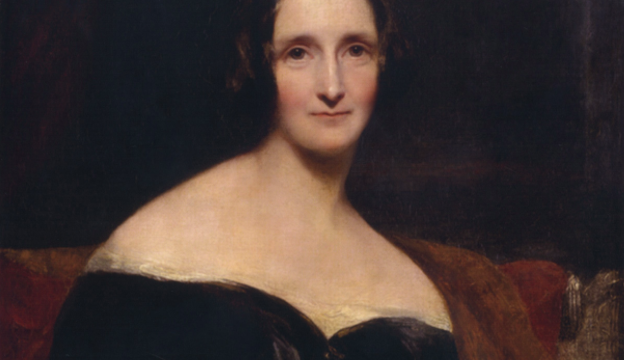 Ahead of her time politically and socially, Mary Shelley was an uncommon woman by any stretch. We’ve only shown the bare bones here – go flesh out your knowledge by Googling her.